Beverage recipes sometimes call for “raspberry syrup,” a bright red, sugary syrup that gives a raspberry flavor and color to drinks. Why buy the bottled stuff when it’s so easy to make your own? Raspberries are in season right now, which means you’ll have all kinds of beautiful berries to choose from at the market. Plus, you’ll have the added benefit of knowing what went into your syrup– just three ingredients, all natural, nothing artificial. 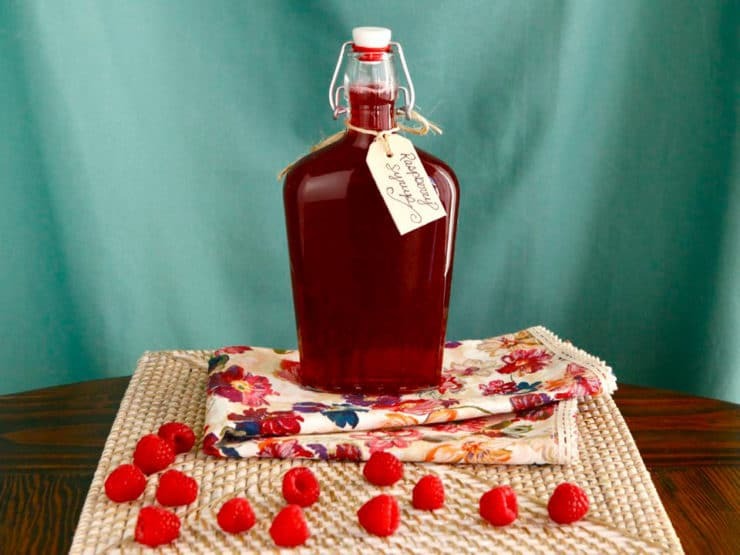 Homemade raspberry syrup can be added to beverages and cocktails to give them a strong, sweet raspberry flavor. Try flavoring lemonade with it to make raspberry lemonade or seltzer to make a raspberry Italian soda. It makes a lovely addition to cocktails and mocktails. Reduce it to a thicker consistency, and you can drizzle it on pancakes or waffles as an alternative to maple syrup. Yum! 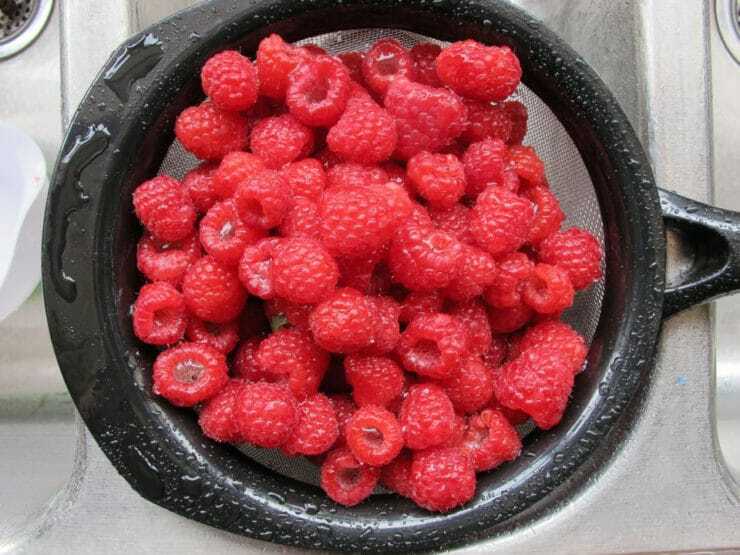 Place the raspberries in a medium saucepan. Cover with water and bring to a boil. 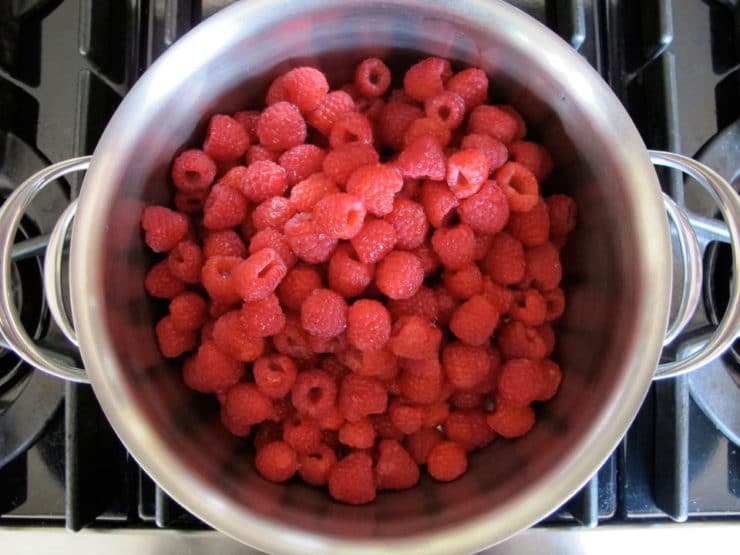 Reduce to a medium simmer and let the raspberries cook for about 20 minutes. Skim any foam that rises to the top. After about 20 minutes, the raspberries will have lost most of their color and the water should be deep pink/red in color. Remove from heat. Strain the raspberry liquid through a fine mesh strainer into another clean pot, separating the solid berries from the liquid. 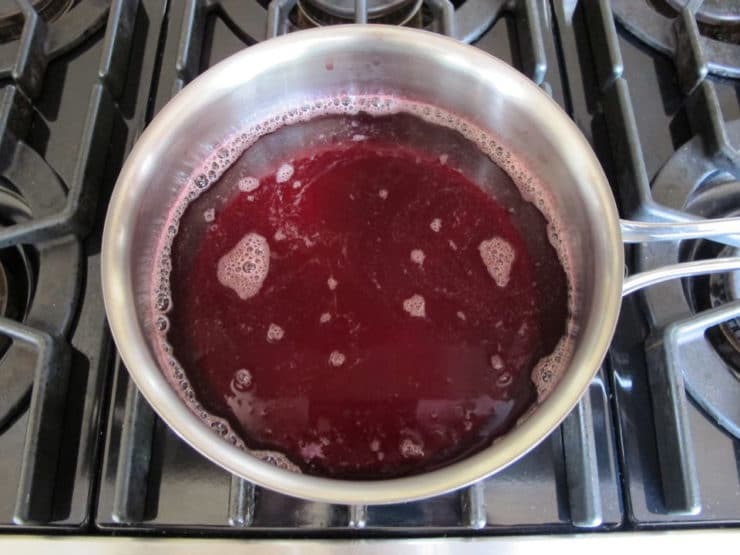 DO NOT press down on the solids to extract more juice; it's tempting, but doing this will make your raspberry syrup cloudy. Once the raspberry liquid has been strained, discard the solid berries. Add 2 cups of sugar to the raspberry liquid. Bring back to a boil, stirring frequently to dissolve the sugar into the syrup. Let the syrup simmer for 5 minutes till the sugar is completely dissolved, skimming any additional foam that rises to the top. Thank you for the recipe. I had picked a bunch of raspberries after a day of heavy rain and they were flavorless. Making this syrup was a great way to make good use of them, because the cooking concentrated the flavor. I used the KitchenAid Mixer Juicer Attachment with the low pulp screen to remove a lot of seeds, and then poured the liquid through a metal mesh sieve to get the rest. Very happy with the results. To serve, I put some in a glass with ice then added club soda for fizz. My husband liked it too. Simple yet tasty! Can we freeze this instead of canning? My grandmother gave me a 2l ice cream container of each raspberries and black Doris plums. I’m not quite sure how to convert the ingredients for the amount of berries I have. Thank you for this recipe. I have been buying a cherry syrup and now I can’t get it anymore. I got to thinking, how hard can it be to make? So now I’m excited to make cherry and raspberry syrups. I will use frozen fruit. I will use them to sweeten and add flavor to my homemade rhubarb wine. I would love your rhubarb wine recipe also if you don’t mind sharing. Joyceclifton4@gmail.com. thank you!! We are making this syrup as I type. I am making the pureed version as we are planning to use this as a swirl in lemon ice cream. I’ll let you know how this works out. Hi, I make raspberry cordial from the leftover raspberry puree, put it into a large canning jar, add a litre of Lamb’s rum and let it sit in a cool space, shaking it every day for six weeks and then I can it. Afterwords you should let it sit for at least two months before drinking it. If you make this in September, you will be drinking it by Christmas. The flavour is amazing. The recipe calls for vodka, not rum, sorry about that. I’ve watched “Murder She Baked: the deadly recipe”, a Hallmark Movie with Alison Sweeney and Cameron Mathison and the chocolate fudge cupcake recipe in the show had a “secret ingredient” which turned out to be 1/4 cup of raspberry syrup. I’m going to try this. How do you can it? Hey Joanne thanks for your post combined with Tori’s recipe it gives a double bang. I have 11 varieties of raspberries and harvest and or give away 100 + gallons a year to friends, family and acquaintances. Hi, I know this is an older post hut hopefully you can help me! I accidently added the sugar with the water and raspberries before cooking. Will it still cook correctly?? Hi Krissy, yes it will be fine no worries! i just made it to thick, so when making my raspberry ice tea, i just had to boil the tea again and add the thick raspberry syrup to the hot tea boiling to melt it again. Finally tea came out perfect. Suggestion: Instead of discarding the berries, I would save them (you can freeze them) until you get ready to make Jam, and just mix them with red berries to make jam. They should taste just as good. Just an idea. How long will this syrup keep bottled in the fridge? I made this but I didn’t cook it. I just put it in a blender, then dissolved the sugar in boling water.strained, then added the sugar / water mixture. Is it ok to keep even if I didn’t boil it? Cindy I prefer boiling the syrup at least once for 1-2 minutes to kill any bacteria that might have been lurking on the berries. Either way, I recommend keeping this syrup refrigerated. No problem with the lack of foaming, as long as the syrup has thickened to the proper consistency and is sweetened to taste it should be fine. Thank You! This turned out great! I will love the extra flavor added to my tea! How long can you store this in the refrigerator? Hi Janet, this should keep for at least 1 month, if not longer. I don’t like wasting the berries so I do this a little differently. I. Place the water and raspberries in the pan.Heat just to a boil then puree. (a stick blender works great) Strain out the seeds. Then add the sugar and cook til syrupy. The remaining seeds the get steeped with my next batch of iced tea. I am going to try it and I will let you know, thanks! Hi, I was wondering if I could pour this into ice cube trays and freeze it? Good question Conni. It would probably work but I’ve never tried it, so can’t say for certain. I froze my leftover syrup in ice cube trays then put them into a freezer bag to keep. They don’t freeze completely solid, like an ice cube but do keep their shape fairly well. I can actually pinch off half of a raspberry cube to add to my beverage when I want less than a full cube. One qt.of raspberries juice ,How many Oz. Water and sugar should be added. Reg I don’t know, I’m sorry. This recipe uses whole raspberries, not juice. How many ounces does this make??? Is there any way to use the berries after they’ve been strained? Or would they not be good any more. I LOVE raspberries, and I would hate to throw them out if they are still good. Looking forward to trying this recipe! Hi Katie, they lose their color and a lot of their flavor to the syrup– but they are still pretty tasty. I have used them to top yogurt or ice cream. Enjoy! Can I juice the raspberries and then add the juice to the water and sugar? I’m addicted to the raspberry flavor shot from Tim Hortons for my coffee. I can’t wait to make my own! 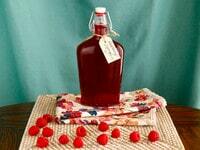 Hi can i use frozen raspberries to make the syrup?. Hi Pat– yes that should be fine. How much of the syrup would you use to flavor 1 gallon of iced tea? Would you boil the syrup with the tea when making, or add it after? H.W. Meade I don’t have a specific amount to recommend, you may add it to either hot or cold tea. I would simply recommending adding it little by little until the flavor is right for you. HI. I was wondering if I could use honey for the sweetner. We are trying to be paleo, but i just love raspberry syrup in my coffee. Thanks for any advice. Hi Amy, I’ve never tried this with honey. If you try it will you please let us know how it turned out? Can you add everclear to this or some other strong alcohol to make a drink? Hi Abe, you can add a little of the syrup to a clear hard liquor like vodka with clear soda, or add a splash to champagne. Anywhere a cocktail recipe calls for “raspberry syrup,” this recipe may be used. There are lots of possibilities here! Yes, they do have one. However it’s not on the menu. I hope it works too! Hi tori, is this syrup suitable for making the cotton candy frap from Starbucks? I would love to make the drink at home you see. Hi Pearl, I have never tasted the cotton candy frap (I didn’t know they have one? ), so I’m not sure if the flavor is similar. This is a nice, sweet, raspberry-flavored syrup. Hope it works for you! Could you also use blackberries to make the syrup? I love both raspberries and blackberries and thought if I could make some of both that would be great. How many cups of frozen raspberries in 2 pounds? Hi Margaret, it’s about 5 1/3 cups. Once you strain the raspberries what do you do with the raspberry water in the first pan? Do you add to the syrup and then cook it? Or discard with the wasted raspberry pulp? Hi Cheri, I’m not sure I understand your question. 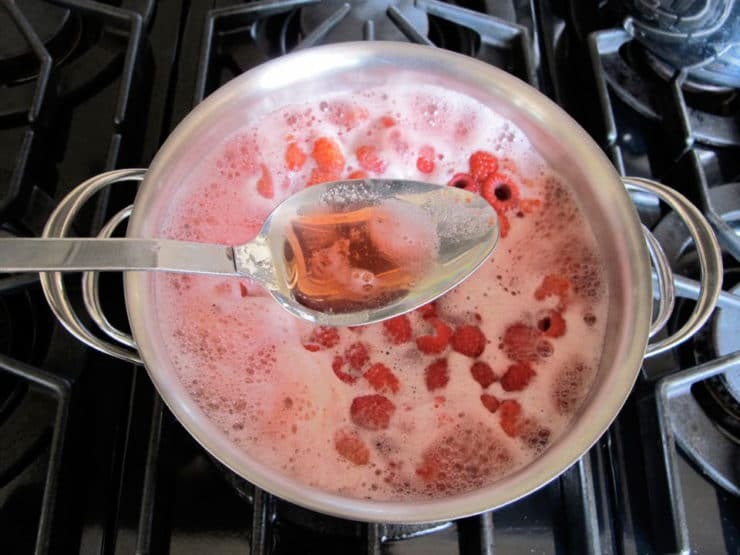 The raspberry water becomes the syrup after you cook it down with the sugar… no liquid is discarded, only the solid berries. Does that make sense? Hi, Tori. Thank you for this recipe! i’m so excited to make it this week. I’d like to bottle some for friends – I’ve never used the type of jars that you show for canning, and would like to. Can you help me with some canning advice? After preparing the syrup, boiling it for 5 minutes and adding some lemon juice as I bottle – do I water bath it? I assume I’d need to cover the bottles with water in the water-bath canner? Any advice would be appreciated. Thank you so much. Hi Peggy, yes you should use the water bath/boiling water method. I use mason jars for home canning, I wouldn’t can it in the bottle that appears in this post. 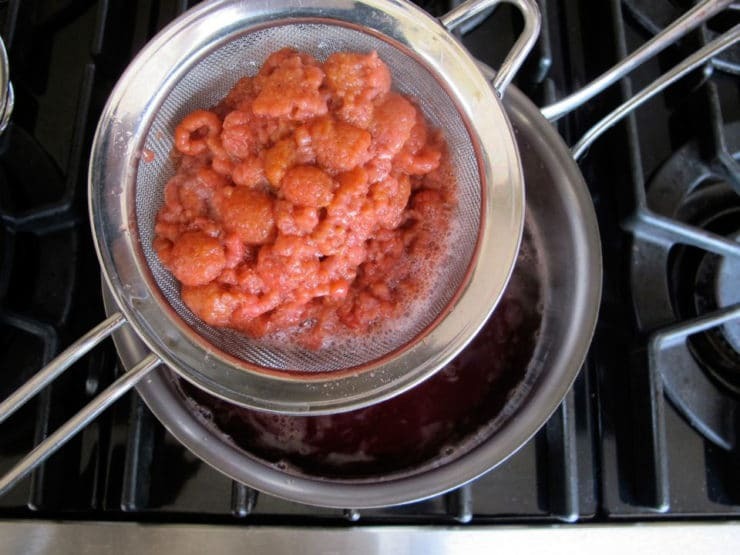 Check out the following post which covers canning in depth: https://toriavey.com/how-to/2013/09/how-to-can-boiling-water-method/ Using that method, cover the jars by 2 inches of water and process for 10 minutes. Hope that helps! Hi, I really want to make this for my summer iced teas this year. Can the sugar possibly be substituted with Agave syrup instead of sugar?Or is sugar needed for the process. Hi Rocio, the syrupy texture here comes from the addition of sugar. You can use agave ,but it will be a much more watery syrup and will not thicken the way it should. If you don’t mind having a more watery syrup, it will probably be fine… but the agave is heavier than the water, so it may settle/separate a bit after it cools. Hey I was wonder where you got those bottles they are adorable!!! I am a big Raspberry syrup lover and I love to drizzle it over almost everything and making a syrup at home is a really good idea. Hey Tori, I have seen people in France pour raspberry syrup — like Torani syrups — into chilled white wine. I wanted to try something non-alcoholic in case one of my guests wanted to add it to lemonade or Pellegrino. Alas, my local green market was out of raspberries so…I ended up buying creme de cassis anyway but will try this when I next see the berries. Hi Sebastian! Correct me if I’m wrong, but I believe a Kir is a cocktail made from creme de cassis and white wine. You can certainly make a cocktail using the raspberry syrup and white wine, although I’m not sure how similar it would be to a Kir, given the creme de cassis is a liqueur and contains alcohol. I love your blog! Thank you for all the wonderful recipes and tips. I was wondering if you have ever canned this syrup? I would love to make enough for gifts for the coming year. My first grandchild is due at the end of December so I am already working on family gifts. I know my daughter will need me, so I need to be ready a little early this year:) Thanks so much Tori! I have never canned this syrup Kelly, but I have a feeling it will work great as long as you use sterile canning procedures. Make sure you boil the finished syrup for a full 5 minutes before canning. You should also add 2 tbsp of lemon juice at the end of cooking to increase the acidity a bit. Mazel tov on your new grandchild! !